Diffuse idiopathic skeletal hyperostosis (DISH) -- also called Forestier’s disease -- is considered to be a form of Osteoarthritis or degenerative arthritis. The condition can be potentially progressive. 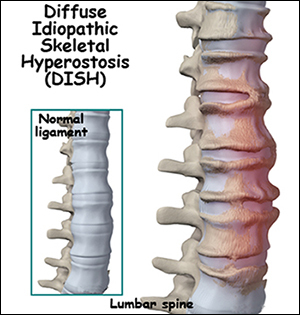 Diffuse idiopathic skeletal hyperostosis is a condition which implies a bony hardening (calcification) of ligaments at the points at which they are attached to the spine. In other words, one of the main characteristics of this condition is the unique, flowing calcification along the sides of the proximate vertebrae of the spine. Diffuse idiopathic skeletal hyperostosis is generally linked to tendinitis (inflammation) and calcification of tendons at the point of their attachment to the bone. As a result, the condition can often be a causative factor behind the formation of bone spurs (like heel spurs) in the individuals affected by it. The exact cause behind the occurrence of Diffuse idiopathic skeletal hyperostosis is not known. Nonetheless, the condition is commonly associated with the metabolic syndrome; and it occurs more frequently in individuals suffering from diabetes mellitus, obesity and other health conditions which may raise insulin levels in the body. The risk of developing the condition is typically higher for men as compared to women. Moreover, the condition usually affects older adults, particularly those above 50 years of age; and is also associated with long-term use of certain medications termed as retinoids. The standard treatment for Diffuse idiopathic skeletal hyperostosis involves the use of anti-inflammatory medications because the condition typically leads to the inflammation of the areas of the spine and tendons. The medications recommended for the condition basically help to minimize inflammation in the affected parts of the body, and to relieve pain. Some excellent herbal formulations offered by Planet Ayurveda herbal manufacturing company can be very useful in managing the symptoms of Diffuse idiopathic skeletal hyperostosis. The formulations are prepared from 100% pure and natural herbs; and are completely safe to use because they do not contain any additives, chemicals, or preservatives. Boswellia Curcumin capsules are prepared from a combination of two potent herbs --- Shallaki (Boswellia serrata) and Curcumin (Curcuma longa). This amazing herbal product has proven anti-inflammatory properties; thanks to the presence of certain chemical compounds (such as diterpenes, triterpenes and tetracyclic triterpenic) in Shallaki, and the presence of ‘Curcumin’ chemical compound in Curcuma longa. The use of these capsules can reduce inflammation, provide relief from pain, and manage other symptoms associated with Diffuse idiopathic skeletal hyperostosis. Recommended dosage of Boswellia Curcumin capsules for managing the symptoms of Diffuse idiopathic skeletal hyperostosis: 1 capsules with plain water, two times a day, after meals. The preparation of these tablets involves the number of beneficial herbs which can together be very effective in strengthening the muscles, relaxing the nerves, and pacifying the aggravated ‘Vata’ dosha of the body. The herbal components of Yograj Guggul tablets include: Guggul (Commiphora mukul), Amla (Emblica officinalis), Haritaki (Terminalia chebula), Bibhitaki (Terminalia bellirica), Chitrak (Plumbago zeylanica), Mustak (Cyperus rotundus), Ajwain (Trahyspermum ammi), Sonth (Zinger officinale), Pippali (Piper longum), Gokharu (Tribulus terrestris), Jeera (Cuminum cyminum), Vidanga (Embelia ribes), and Rock salt. Recommended dosage of Yograj Guggul tablets for managing the symptoms of Diffuse idiopathic skeletal hyperostosis: 2 tablets two times a day with lukewarm water. These capsules are prepared from the pure and natural extracts of a number of beneficial ingredients including Parval pishti (Coral), Akik pishti (Agate), Mukta pishti (Pearl), Giloy satva (Tinospora cordifolia), Jawar Mohra pishti, and Kamdhudha Ras. Coral Calcium capsules are useful in maintaining healthy calcium levels in the body, strengthening the bones, maintaining the health of the immune system, supporting the healthy functioning of the heart, and maintaining healthy muscles and nerves. Recommended dosage of Coral Calcium capsules for managing the symptoms of Diffuse idiopathic skeletal hyperostosis: 1 capsule twice a day, with plain water, after meals. Hakam churna -- also called ‘Tridoshic Rasayan’ -- is a remarkable herbal powder prepared from a combination of several herbs which are widely known to provide relief from pain in legs, relieve pain in the arms, and manage other DISH symptoms. The herbs used for preparing Hakam Churna include: Chandershoor (Lepidium sativum), Methi (Trigonella foenum graecum), Ajwain (Trahyspermum ammi), and Kalonji (Nigella sativaa). Recommended dosage of Hakam Churna for managing the symptoms of Diffuse idiopathic skeletal hyperostosis: 3-5 grams of the churna should be taken with hot water, two times a day, after meals. This product is another excellent herbal powder which constitutes a combination of herbs that have amazing anti-inflammatory properties, and can make the muscles strong, along with relieving pain. The herbs used for preparing this powder also have an abundant presence of phytochemical compounds like such as diterpenes, triterpenes, and tetracyclic triterpenic. The herbal ingredients of this product include: Ashwagandha (Withania somnifera), Methi (Trigonella foenum graecum), Haridra (Curcuma longa), Sonth (Zinger officinale), Gorakhmundi (Sphaeranthus indicus), and Surnajan (Colchicum autumnale). Recommended dosage of Aamvatantak Churna for managing the symptoms of Diffuse idiopathic skeletal hyperostosis: 1/2 to 1 teaspoonful of the churna should be taken two times a day, with plain water, after meals. 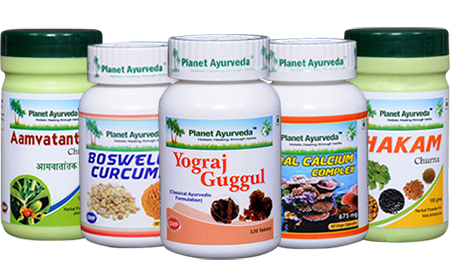 All the above mentioned herbal products offered by Planet Ayurveda for managing the symptoms of Diffuse idiopathic skeletal hyperostosis are prepared under the guidance of renowned Ayurvedic experts. These products are prepared from standardized natural extracts of beneficial herbs, and are extremely useful in managing the condition without any side effects.